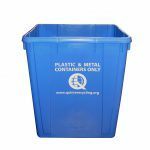 Tall curbside blue box for plastic and metal containers only. Curbside blue boxes are usually available from your local municipal office as well. While there is normally a fee of about $8.00, policies may vary from one municipality to the next. You can purchase or exchange your broken blue box at any of the following locations. Prince Edward County Municipal Office, 332 Main St.
Marmora & Lake Municipal Office,12 Bursthall St.
Tyendinaga Municipal Office, 859 Melrose Rd. Tweed Municipal Office, 255 Metcalfe St.
Frankford Municipal Office, Trent St.
Stirling-Rawdon Township Office, 14 Demorest Rd. 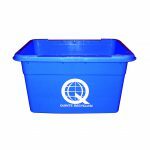 The following are other types of boxes available for sale at our recycling plant in Trenton. These are not for curbside use.